Funk-rock is evidently very hard on drummers, at least if the history of Californian rockers Primus is anything to go by. After forming in 1984, and with just one other line-up change, Primus went through seven drummers until a hiatus in 2000 (by which time, presumably, there were simply no drummers left). Other than a somewhat chequered personnel history on the skins, Primus have been an incredibly reliable and constant originator of US post-punk funk metal for nearly three decades. Their seventh studio album, 'Green Naugahyde', is released in Europe today (in the US tomorrow) and is the first new material since the 1988 line-up was restored, featuring Jay Lane on drums, and the first studio album since 1999. You can listen to album tracks HOINFODAMAN' and 'Tragedy's a'Comin' via their label's Soundcloud account (www.soundcloud.com/ato_records). 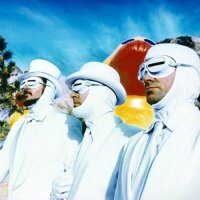 Primus are most widely known as the band behind the theme to the TV show 'South Park' alternating Les Claypool's lead vocal with the voices of Stan, Kyle, Cartman and the unfortunate Kenny. The band's biggest commercial single however, was 'Wynona's Big Brown Beaver', from 1995's 'Tales from the Punchbowl'. Apparently, actress Winona Ryder accepted that the track was not about her, although her then boyfriend, Soul Asylum singer David Pirner, was less gracious, renaming one of his band's live songs 'Les Claypool's a Big F**king A**hole' (without the asterisks). Primus have long been associated with slightly eccentric, often humorous themes and most of America did not bat an eyelid at Wynona and her beaver and the single was the band's biggest, peaking at No 23 on the Billboard Hot 100. After this summer's sold-out gigs in Manchester and London, David Pirner's least favourite band are returning to the UK next year with Primus playing two massive gigs at the Royal Albert Hall on Wednesday 4th and Thursday 5th April 2012. We will have tickets available for both dates when they go on sale at 10AM (moved from 9AM) on Friday 16th September, priced £25.